Two Departures and a Grilling Stephen Harper loses, Joe Biden bows out, and Mrs. Clinton survives the Benghazi Committee. An interesting question for history is who was the real leader of the West the past half-dozen years, Angela Merkel of Germany or Canada’s Stephen Harper, voted out this week after almost 10 years as prime minister. His great success was in helping bring his country through and past the global meltdown of 2008. He was loyal to Western principles and a friend of America even when, as in recent years, its leaders’ decisions left him doubting and dismayed. A general rule of politics: After 10 years they are going to throw you out. But the vote was overwhelming after a charmless, dour campaign. The incoming prime minister is the 43-year-old son of charismatic former Prime Minister Pierre Trudeau. Justin Trudeau has been a snowboard instructor, schoolteacher, bartender, bouncer, speaker on environmental and youth issues, and advocate for avalanche safety. Sensing “generational change” and gravitating toward “a life of advocacy,” he entered politics and served two terms in Parliament. He has been head of the Liberal Party two years. He is handsome, has a winning personality, exhibited message discipline during the campaign, and is a talented dancer. There’s a sense we in the West have entered a new screwball phase. Watching Mr. Trudeau’s victory speech, I remembered the columnist Dorothy Thompson reaction on watching the newly inaugurated President John F. Kennedy. There’s something not fully stable there, she thought. But we have to let history do what it enjoys doing, which is surprising us. Joe Biden’s decision not to run for president left me sad. He would have enlivened things. He has always reminded me of what Democrats were like when I was a kid—kind of normal and earthy and fun. They did not spend their time endlessly accusing people of being sexist-racist-homophobic-gender-biased persons of unchecked privilege. They would have thought that impolite. I can’t imagine Joe Biden ever needed an image consultant to coach him on how to be himself. As if he had a choice. Going in, the question about Hillary Clinton and the Benghazi Committee was: How will she come out? Would she emerge triumphant, bruised, stronger, exposed? How would the Republicans, who’ve proved themselves largely hapless in grilling those involved in various scandals, do this time? In 2013, in front of a Senate committee, Mrs. Clinton blunted attacks with her dramatic rhetorical question: “What difference, at this point, does it make?” When I watched I thought, “She just won.” But afterward “What difference does it make?” became a kind of shorthand for high-handed theatrics. It is hard to judge the impact of most Clinton performances in real time because Mrs. Clinton is a practiced actress and it takes people time to figure whether they believed the act or not. Her goal was clearly to take all comers and end this. She wanted to make the Republicans look like tiresome obsessives, which usually wouldn’t be hard. She took her seat in the hearing room handsomely coiffed, beautifully made up, wearing a sober, dark high-end pantsuit. Young journalists tell me I’m not allowed to describe how she’s dressed or whether she looks tired (no, well-rested) or stressed (no, cool as a cucumber). I tell them if they’re going to be journalists they can’t start out as word cops. Nor should they in their work put politically correct limits on their ability to describe a scene. If you mean to be a craftsman, you cannot start your career as a censor. 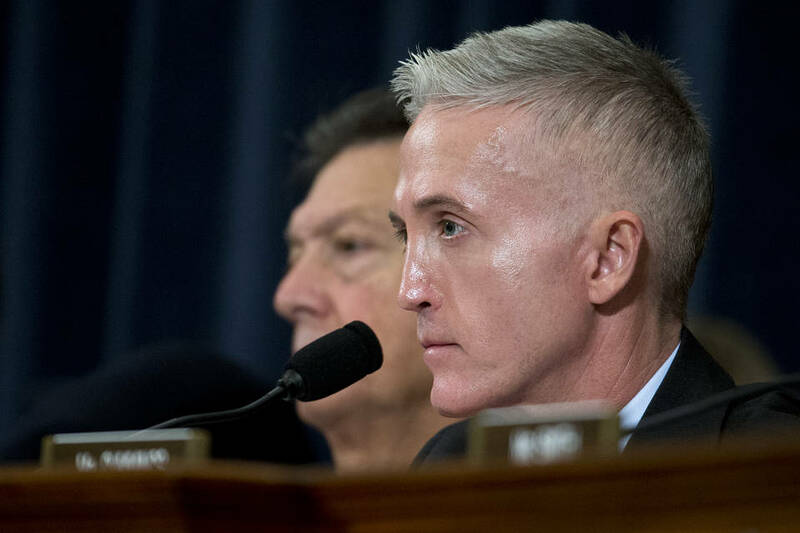 Chairman Trey Gowdy (nondescript suit, hair under control) wasted no time: “We are going to pursue the truth in a manner worthy of the memory of the four men who lost their lives.” He set a tone not of theatrics but factuality. He defended his committee’s investigation by asserting previous congressional probes had not been “serious” or “thorough” because they lacked sufficient access to relevant documents. This undercut Mrs. Clinton’s ability to make points by repeating, as she has recently, that this is the eighth investigation. Mr. Gowdy cleverly brought up Rep. Kevin McCarthy’s witless comment suggesting the purpose of the investigation had been to damage her popularity. He blunted every charge and complaint he knew she was about to make. She sat blank-faced, furiously thinking. Elijah Cummings, the panel’s ranking Democrat, said in his statement the investigation is political, a “taxpayer-funded fishing expedition.” Having watched him in hearings the past few years I cannot determine whether his chronic umbrage is real or feigned. In Mrs. Clinton’s opening statement she spoke slowly, in a calm, lower-register voice. When she spoke with personal warmth of the late ambassador, Chris Stevens, she was actress-y in a way you’d like if you like her and not if you don’t. She then perhaps cheekily pivoted to what we can learn from the tragedy. This was meant to establish her deep experience and command and was occasionally off-point: “Retreat from the world is not an option.” She evoked the Reagan-era deaths of 258 Americans in the Beirut Marine barracks and, more cleverly, security failures in the administrations of her husband and of George W. Bush. That was meant to make Benghazi—only four dead—look comparatively insignificant. The first hour-and-a-half seemed to focus on niggling things, as if no one could get their hands on the thread. Viewers at home may have given up. Then the pace quickened. There were hundreds of requests regarding security issues in Benghazi in 2012, and Mrs. Clinton said not one reached her desk. This is remarkable. A secretary of state who supported a military action that unleashed chaos and sends her friend, the ambassador, into that chaos has no awareness of his requests for more security? Sidney Blumenthal had her personal email address but Chris Stevens didn’t? There were substantive fireworks when Rep. Jim Jordan suggested the administration used a protest over an anti-Islam video as a cover story for what Mrs. Clinton knew to be a planned and deliberate terrorist attack. He suggested a motive: The attack came less than two months before the 2012 election. He presented proof she knew Benghazi wasn’t a popular protest about a video. She never really answered the charges, falling back on quickly unfolding events, confusion, a fluid situation. She dodged, and it was obvious. “I wrote a whole chapter about this in my book,” she attempted. She pretended the line of questioning was an insult to those who died. No, it was an insult to her. She was passive-aggressive: “I’m sorry that it doesn’t fit your narrative, Congressman.” She later spoke of how wounding it is to have one’s assertions received with such skepticism. This was unpersuasive. How did she do? How did they do? The Republicans were able interrogators. For Mrs. Clinton it was mixed. At moments she was poised and in command, at others more scattered and scrambling. She has considerable faith in her talent for double talk. She suffered through and survived, and will soon be saying what she wanted to say: I took any and all questions, there is nothing to add, the issue has been addressed. Next.